Animal lover……yep, that’s Marcy! Animals have been an important part of her life since she was a child. Pets have always part of her family. She has had the entire range from hamsters and turtles to dogs and horses. Marcy’s love for animals hasn’t only been demonstrated through sharing a home with a menagerie of critters. She has also focused volunteer time and advocacy throughout her many blessed years. As a co-founder of the Pet Food Pantry, she was able to assist qualified pet guardians by providing pet food for their precious pets. 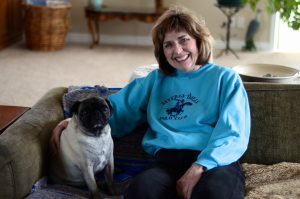 Marcy has also enjoyed supporting and volunteering at the Idaho Humane Society for many years. Another area of great need is ensuring that Idaho pets are spayed and neutered to avoid overpopulation resulting in pet homelessness, illness or death. As a board member with S.N.I.P. (Spay Neuter Idaho Pets), Marcy works with other caring individuals to help fund and make possible affordable neutering and spaying pets and feral cats. Marcy and her husband currently share their home with 2 rescue cats, a rescue dog, a parakeet, 4 fish, 1 frog and 4 ponies. She would love to add to their pet family, but for now, the current pets keep her busy. To help fulfill her love for animals, Marcy enjoys the wonderful friendships of the pets and their loving guardians as a pet sitter. Working as a pet sitter is truly a gift to Marcy. She gives back a little piece of love and care with each and every pet visit.